Debut author Rhonda Riley has produced one of the most exquisitely written books I’ve read in a long while. 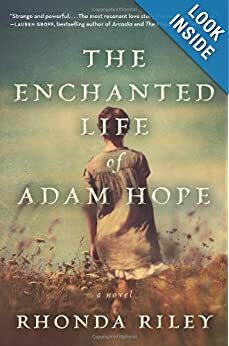 The Enchanted Life of Adam Hope has a mystical quality that warms my Supernal heart. The story is told by Evelyn, born in North Carolina during the Depression, who comes into womanhood as World War II is ending. At the age of seventeen she is charged with keeping her aunt’s farm functioning to provide food for her mill-town family. One stormy night she discovers the naked body of a man she at first thinks must be a burned soldier returned from the war. A, as she comes to think of him, morphs into the love of her life. The world ultimately comes to know him as Adam Hope. He and Evelyn share an abiding devotion and amazing secret. Adam is either un-human or the ultimate human. Their extraordinary story unfolds against an ordinary background of farm life and the post-war years of America. This is a beautiful book. Every word is carefully chosen for full effect. Adam’s appreciation of life, land, and love is a reminder that we should embrace the moments of our lives. The Enchanted Life of Adam Hope by Rhonda Riley–highly recommended!